We have most vaccinations ready to go at our walk-in clinic located off Park Rd. near Selwyn Ave.
No appointment needed, just walk right in! Carolina Express Clinic is equipped to handle most common shots and vaccinations in an extremely clean, comfortable and sterile environment. General guidelines on prenatal care in the US state that, if there is an urgent need for tetanus protection during pregnancy, a Td vaccine should be administered. If there is not an urgent need and the woman has previously had a tetanus vaccine, Td vaccination should be delayed until the postpartum period. Postpartum women are recommended to receive Tdap prior to discharge after delivery who have not received Td or Tdap vaccine in the last two (2) years. 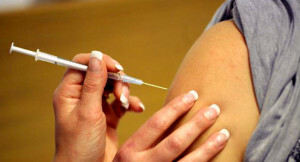 It is recommended by some that pregnant women who have never received tetanus vaccine (i.e., never received DTaP, DTP or DT as child or Td or TT as adult) receive a series of three (3) Td vaccinations starting during pregnancy to ensure protection to the mother and baby from these diseases. Carolina Express Clinic also performs a variety of administrative physicals, DOT physicals and all sorts of immunizations that may be required for work, travel or school. Vaccines for whooping cough, tetanus, diphtheria and pertussis are all available Monday-Saturday on a walk-in basis. Minors must be accompanied by an adult or parental guardian and have parental/guardian permission. Our goal is to see you within 10-15 minutes of your arrival. Visit our walk-in clinic today! Carolina Express Clinic is located in South Charlotte off Park Rd. near the intersection with Selwyn Ave. There is a Harris Teeter Express, Penn Station Subs and Portofinos restaurant in the same shopping center. Contact us for more information, visit us today and sign in/register beforehand for even faster service!